Camping essentials. Five items you really need. "I do benefits for all religions. I'd hate to blow the hereafter on a technicality. We have all seen great lists of camping essentials, but in our opinion there are five items you absolutely should not do without. Your camping trip sometimes may end up being a total write-off for the simplest reason. That’s because we don’t get to do it very often. The average camper may get to spend 15 or 20 days per year sleeping out in the great outdoors. Judging by the many accessories in today’s RV’s, roughing it may not mean the same as it did years ago. 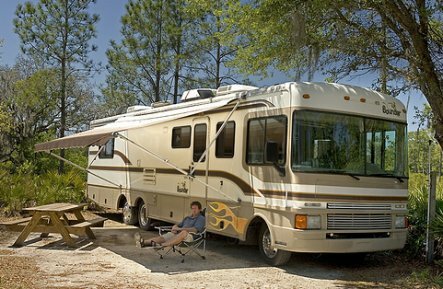 Did you ever wonder what it costs to rent a truck camper or a motor home for your vacation? You will be surprised to see how little it costs. As a couple who have had a great many nights under the stars we have compiled a short list of five items we would not leave home without. Your list may differ from ours but that’s human nature. Our five most important camping items. A large tarpaulin with plenty of rope. We camped on the west coast of British Columbia, as well as many years on Cape Breton Island in Nova Scotia. In these two areas it rains plenty. On the east coast we simply put up with the rain. On those days we put up with it or went home. The ground would get wet. Everyone was bored while trapped inside the tent. Not until we camped in British Columbia did we learn what to do. Our first spring weekend trip took us to a beautiful BC Provincial park. The couple next door to our site had a huge tarpaulin set up and lashed to the trees. Two extension poles raised the center up high. It covered the entire site. It rained that night. Next morning they had a campfire going and ate breakfast under the tarp. Their site was perfectly dry. Definite high on our list of camping essentials. An axe, a hatchet and a small bucksaw. Very important tools. You purchase a bundle of firewood. It’s either too large to burn, or too small and burns quickly. You may need to find a dead tree, a piece of driftwood or a large chunk someone else had and couldn’t cut up. The axe will split large pieces. The hatchet cuts the larger pieces down to size. The saw can be used to salvage long pieces. My saw was a Sandvik saw with a 12 inch blade. It had very sharp large teeth that cut through small logs easily. It never dulled. Fire sticks and fire paste. Both are very effective but one or the other will do. Excellent camping essentials. If you want to be able to start a campfire every single time, these products will do the job. We have never had a failure. They are very inexpensive. A package of 12 sticks will last the entire summer. Prepare the fire with tiers of kindling and a few pieces of larger wood. Cut a one inch piece of fire stick. Slip it under the kindling and light it. It will burn until the fire is blazing. Learn how to use a Whisperlite Stove. This information will come in handy. Propane camp stove with an eight pound tank. Two or three burner. Both are excellent. We wore out two, white gas stoves over the year. The kind you pump up to use. The fuel is simply called Camp-stove fuel. They were a bother. They could be dangerous. The propane stove is much superior product. We suggest the eight pound tank as it is very cheap to fill at the local service station, will last hundreds of hours, and is easy on the landfill. Carry a one pound canister just in case you run out with the eight pound tank. Last but not least. Check your equipment. One year we opened up our large tent during our first trip of the year only to discover the entire upper corner had been torn up and used as nesting material by squirrels during the winter. That trip was ruined. Check your stove, gas container, lamps, flashlights, tents and RV’s. Leave nothing unchecked and you will enjoy a great camping season with your camping essentials. First aid kit. Play safe. Be sure you pack this very important item. Perhaps you are in the market for a trailer of motor home. You should check the Kelly blue book travel trailer listings for things like jayco tent trailers or Keystone rv units or for extremes like a lightweight travel trailer or a luxury motorhome. When you purchase a unit you want to make sure it has a good set of electric trailer brakes and that you know how to set them up and use them. Check the Camping world catalogue for items like camping water filters, camping portable toilets, a camping oven, and fire starter gel. Florida keys camping demands plenty of insect repellant. Take along a folding lawn chair for each person. Dutch oven campfire recipes are great to take along. Your camping supply list should a camping heater for the cool nights.